Today I am participating in two fabulous things... November's Tomie dePaola Virtual Book Club for Kids Blog Hop and the 21 Days of Contagious Gratitude challenge. Since I have so little time to blog these days with a new baby, I thought I'd combine both posts and share a popcorn themed gratitude post! My kids and I had fun creating these popcorn projects... and we'll have an even better time sharing them with some of our friends later this week! This month we chose to spotlight The Popcorn Book by Tomie dePaola. It is a delightful book with lots of facts about popcorn along with cute illustrations. The book features two boys who make popcorn and learn about the history of popcorn in America along with other interesting facts. For my toddler we mostly looked at the pictures and talked about the simple details that were depicted in them while my 4 year old son loved learning the facts and having us read most of the text to him. As part of the 21 Days of Contagious Gratitude Challenge, I have been trying to recognize simple things that I am grateful for each day. I have LOVED the things that many of you have shared with me on our Facebook page too. My kids and I have many many great friends through church, school, and our neighborhood. 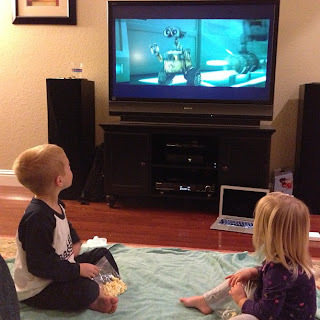 After we read The Popcorn Book we decided to make popcorn too and have a popcorn move night! Our kids loved the popcorn so much that they wanted more the next night. We decided to try out a new-to-us caramel popcorn recipe and while I mixed, the kids sampled and made the popcorn into mini popcorn balls. I used the rest of the caramel popcorn to make a special Mom Project Thank You gift for some friends who recently threw me a cute baby shower. 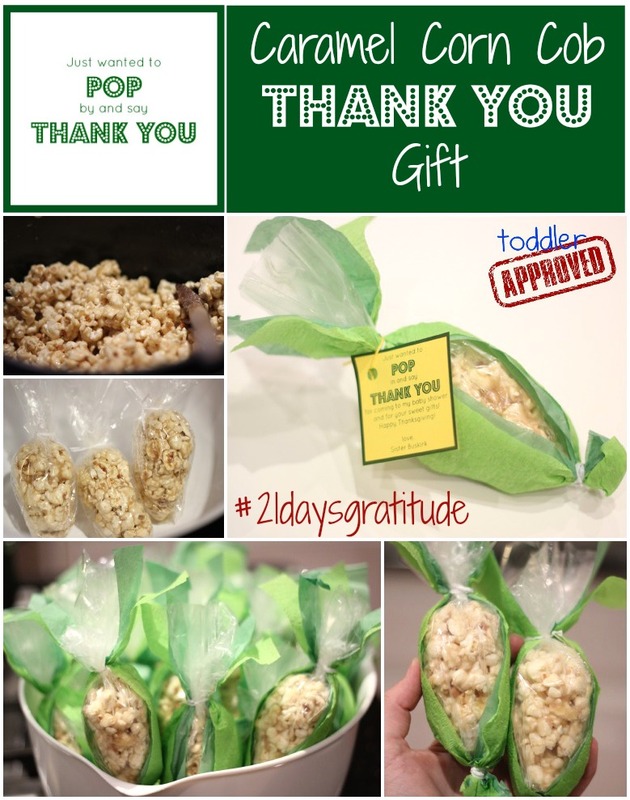 I loved this carmel corn on the cob idea from Raising Arizona Kids, so I grabbed similar materials that we had around the house and made some thank you carmel corn on the cobs for our friends! As if that wasn't enough popcorn fun already, my son wanted to make a popcorn gift for our neighborhood friends! 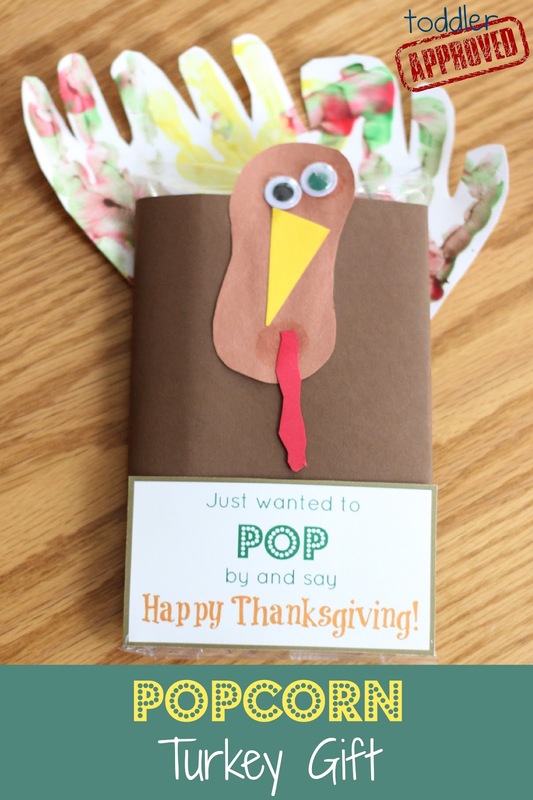 We bought a bunch of bags of microwave popcorn at Target and then made a simple turkey popcorn craft using the bag. My son actually didn't want to help with the craft (he just wanted to give out the gift), so I got my toddler involved with crafting some turkey popcorn gifts! Materials: popcorn bag, paint, hands :), scissors, colored cardstock (brown, yellow, and red), googly eyes, glue, popcorn gift printable (coming soon), and tape. Make handprints on some cardstock using paint. Wrap brown paper around the popcorn bags and secure with tape. Cut out a turkey head from brown paper. 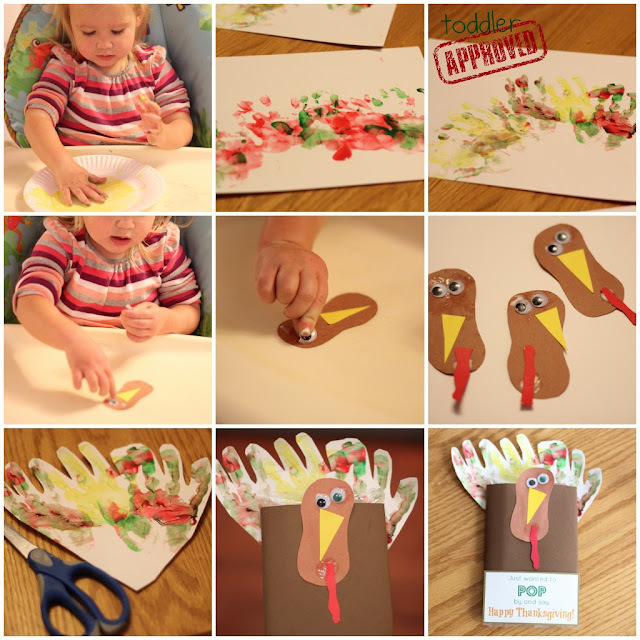 Have your child add a gobbler, googly eyes, and a beak. Older kids can cut these themselves... I cut them out for my toddler and let her put them where she wanted. Let the turkey heads dry and then glue them onto the brown popcorn bags. Cut out some handprints and tape them to he back of the popcorn bags. Print off the Happy Thanksgiving popcorn printable, cut it to fit the popcorn bag (you may need to cut off some of the brown border depending on the size of your bags), and tape it in place. 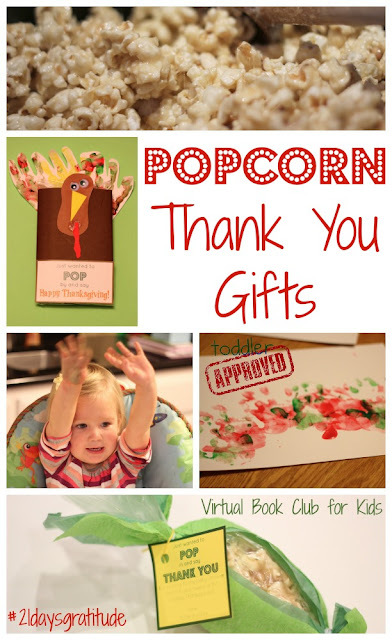 Give out your popcorn turkey bag gifts to friends and neighbors and wish them "Happy Thanksgiving!" Do you have some special friends you might want to make these for? It doesn't really matter if you make something cute or just say the simple words "Thank you!" to your friends... either way is appreciated! I am so grateful for the many many friends I have been blessed with! We haven't lived close to family for most of the time we have been married, so our friends have become our family. They watch our kids when we have an emergency, celebrate birthdays and holidays with us, and are there for us on good days and bad days. We love them! I loved being reminded of the many reasons we are grateful for our friends as we participated in the 21 Days of Contagious Gratitude. It was totally fun to use a popcorn theme, inspired by The Popcorn Book by Tomie dePaola, to help us show our friends how much we appreciate them as we participated in this month's Virtual Book Club for Kids as well! Have you read The Popcorn Book? What book related activities have you done with it? Did you read a book by Tomie dePaola this month? Link up any book related posts in the linky below. I can't wait to come check them out! How fun! So glad you shared and joined in our 21 Days! going to go share! I love these popcorn ideas!!! They are adorable! Adorable and I LOVE the Tomie de Paola book tie in and movie! What a perfect way to spend an evening! !